When the Australian fifty-dollar note was issued in 1972, it bore the heads of two scientists. 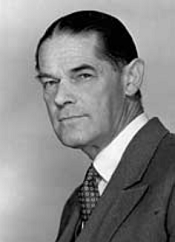 On one side was Howard Florey, co-discoverer of penicillin. On the other side was Ian Clunies Ross. Clunies Ross, though active for some years in productive research, had no major scientific advance to his credit. The strange honour of being imprinted on the currency ‘ in company with Macarthur and Farrer, Greenway, Henry Lawson, Caroline Chisholm and Kingsford Smith ‘ came to him because of the special public position he had come to occupy by the time of his death as spokesman for Australian science, champion of research and promotion for the wool industry, and steady advocate of an open and generous view of Australia’s destiny. These three roles are remembered in the naming after him of the National Science Centre in Melbourne, a sheep and wool research laboratory in Prospect, NSW, and the original wing of International House in the University of Melbourne. A long road in Canberra skirting Black Mountain also bears his name. His reputation was due in part to concrete achievements, but also to the fact that, with a distinctive appearance, personality and style, he caught the imagination of many of those who met him or heard him speak. He was born on 22 February 1899 at Bathurst, New South Wales. His father William John Clunies Ross was himself a scientist, with wide scholarly interests both within and without the natural sciences. At the time of Ian’s birth he was head of the Technical College at Bathurst. He had been born and reared in London, where he had as a young man been a lecturer in geology at Birkbeck College, and he had travelled to Australia at the age of thirty-three in a sailing-ship of which his brother Alfred was master. Ian’s mother was Australian-born and had been a schoolteacher before her marriage. Her father, Charles Tilley, born of farming stock at Hinton Admiral in Hampshire, and possibly also her mother, who came of distressed Irish Protestant gentry from Co. Tipperary, were apparently professional evangelists. Ian’s father’s father, Robert Clunies Ross, a sea-captain born in Shetland in 1790, was a brother of that John Clunies Ross who settled with his family and crew on the Cocos-Keeling Islands in 1826-27 and founded a tiny Malay kingdom. Another colourful relative was Ian’s mother’s brother, William Tilley, who migrated as a young man from Sydney to Berlin and there established a notable school where, with Prussian thoroughness and some eccentric rules, he exposed English-speaking students systematically to the German language. When Ian was four years old, his father was appointed lecturer-in-charge of the Department of Chemistry and Metallurgy at Sydney Technical College, and the family moved across the Blue Mountains to Sydney. For three years, until he was about nine, he and his brother Rob, who was two years older, received all their schooling from their parents. After a short time at a prep. school in Ashfield, Ian was sent as a day-boy to Newington, the Methodist school in Sydney since favoured by the royal house of Tonga and the leading chiefly family of Fiji. Ian’s time at Newington does not appear to have been particularly memorable for him. He in turn was not by any means an outstanding pupil, and it was a source of surprise to his headmaster when he obtained a second-class honour in English at the Leaving examination. In 1914, while he was at Newington, his father died of cancer, leaving the family in much reduced circumstances, and not long afterwards his three older brothers left for the war. Ian reached the age of eighteen in the second-last year of the war, but it seems that his mother exerted her legal right to prevent his enlisting while he was under the age of twenty-one. Accordingly, and despite his father’s dying recommendation against it, Ian entered Sydney University, in the Agriculture Faculty, at the beginning of 1917. At the end of a year in which he passed after a second try in one of his subjects, he transferred to second-year Veterinary Science at the beginning of 1918. In October 1918, news came that two of his brothers, Egerton and Rob, had died within a few days of one another: Egerton, weakened by an earlier attack of typhoid, from pneumonic influenza; Rob in action. Ian seems to have come to science not mainly out of intellectual curiosity, or even out of fascination with the possibilities of applied research, but because he wanted to work with animals. For much of the veterinary course, he was the sole student in his year, and he probably continued to regard himself as an indifferent scholar. Nonetheless, he completed the course in 1920 and was more than a little surprised to find himself graduating Bachelor of Veterinary Science with Honours (BVSc Hon) at the University of Sydney in 1921. He subsequently obtained a Doctor of Veterinary Science (DVSc) completed at the University of Sydney in 1928. From 1922 to 1925 he was a Walter and Eliza Hall Veterinary Research Fellow at the University of Sydney and in 1925 was appointed Lecturer in Veterinary Parasitology, University of Sydney. He joined CSIR as a veterinary parasitologist in 1926 and in 1929-30 he conducted research in parasitology at the Research Institute of Infectious Diseases, Imperial University in Tokyo. He was appointed First Officer-in-Charge of the McMaster Animal Health Research Laboratory, CSIR in 1931, a position he held until 1937. From 1935 to 1936 he was an Advisor on the Pastoral Industry for the Department of War Organization of Industry and in the period 1937-40 was the Australian Member of the International Wool Secretariat in London. Japan’s entry into the war in December 1941 and her rapid push southward brought the fighting close to Australia and inspired a more intense mobilisation. In 1943, Ian was appointed Director of Scientific Personnel in the Commonwealth Directorate of Manpower and also Adviser on the Pastoral Industry to the Department of War Organization of Industry. He held these positions until 1945 while continuing to do some of the work connected with his university appointment. At the end of the war Ian did not return to an exclusive concern with the Veterinary School. In May and June 1945, arrangements were made for him to be released from the University to assist CSIR in making plans for new sheep and wool-textile research. Then in 1946 he was appointed a full-time member of the CSIR Executive Committee, which was situated in Melbourne. He served as Chairman of CSIRO from 1949 to 1959. He was made a CMG and knighted in 1954, was given several honorary degrees and scientific, veterinary and agricultural distinctions, and served on the governing bodies of three universities and as deputy-chancellor of one. After the severe angina that he suffered during the Murray Committee travels, his associates tried to take particular care of his health during his visit to India and Pakistan in January 1958. However, he suffered a slight stroke in June 1958 and a ‘coronary’ attack in September. His return to work after this illness was gradual. He used the extra leisure of this period to write some autobiography and to keep a diary, and also tried to increase his reserves by walking, but he had a further coronary attack in June 1959 and died, ten days later, on the 20th of June, at the age of sixty. A full account of the life and achievements of Sir Ian Clunies Ross can be found by following the link in the Source details below. Clunies Ross AI (son of Sir Ian Clunies Ross), 1975, Biographical memoirs: Ian Clunies Ross 1899-1959, Records of the Australian Academy of Science, 3 (3/4): 84-108. [Australian Academy of Science – http://sciencearchive.org.au/fellows/memoirs/cluniesross.html].